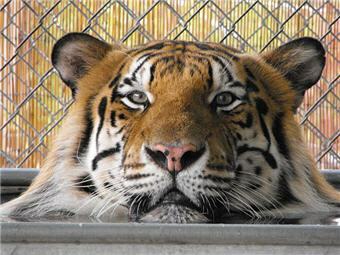 The USDA confiscated Amol, another tiger and a lion from a local entertainment facility and brought them to In-Sync Exotics where they would find a safe, nurturing haven. All three cats were neglected and emaciated. Amol was about 200 lbs underweight, and his teeth are grossly worn down. When he arrived he was very stressed and frightened and remained in his den for two days. Then one evening, as if a light switch went on, Amol came out of his den chuffing. He walked over to the log that’s in his cage and stretched his body as if to say, “I’m home!” And home he is. Amol did not take too kindly to the water tub in his cage. 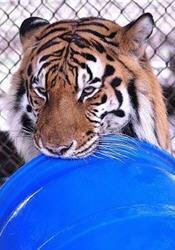 When he first saw it, instead of getting in and splashing around as tigers love to do, he hissed at it. Now, to his caregivers’ dismay, he uses it as a toilet. Amol is a real sweetie towards his caregivers but doesn’t seem to care for strangers. 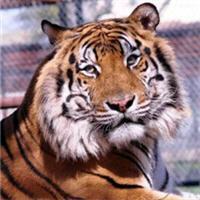 Amol is now a healthy, beautiful tiger. Since his short teeth don’t seem to give him any problem, for now, he won’t need a root canal as we initially thought. He eats well and loves to play with his toys. We are very happy to have Amol as part of our family.